couple’s journey to find the right place to put down roots. Release on DVD and Blu-ray by Universal Studios Home Entertainment September 29, 2009. John Krasinski (NBC’s “The Office”) and Maya Rudolph (NBC’s “Saturday Night Live”) transcend what you’ve seen before with break out performances that are warm, emotional and funny, as they go on their journey visiting friends and family brought to life by the enormously talented ensemble cast including Catherine O’Hara (Best In Show), Jeff Daniels (State of Play), Allison Janney (Juno), Maggie Gyllenhaal (Batman: The Dark Knight), and set to the original music of singer songwriter Alexi Murdoch (Garden State). 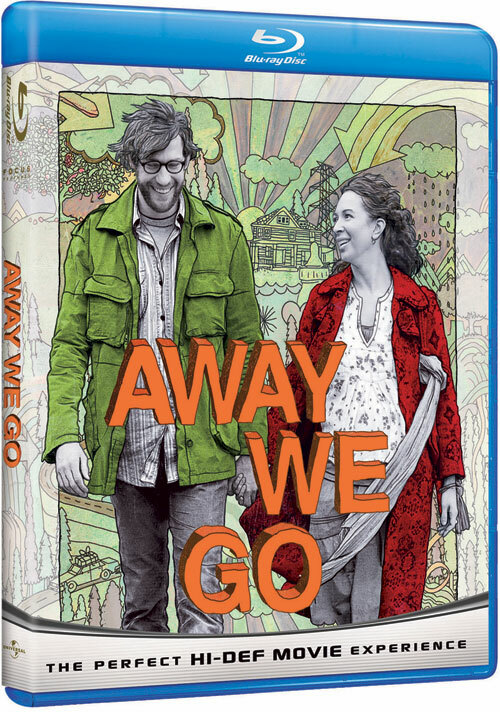 In terms of Special Features, the Away We Go Blu-ray Disc contains a Feature Commentary with Director Sam Mendes and Writers Dave Eggers and Vendela Vida, as well as your standard "Making Of" featurette. It also includes a featurette about the filmmakers approach of creating a film environmentally friendly. Overall Sam Mendes delivers another gem that is very well recommended that deserves to be watch. The same can be said about cast and the extraordinary soundtrack. The Making of Away We Go Director Sam Mendes works with the highly original literary voices of Dave Eggers and Vendela Vida to bring Burt and Verona’s journey to life. Green Filmmaking In this featurette we’ll hear from the key cast and filmmakers on the innovative and effective way Away We Go has pushed the envelope on environmentally friendly filmmaking. BD Live - Download Center Access the BD-LiveTM Center through your Internet-connected player to get even more content, watch the latest trailers, and more! BD Live - My Scenes Sharing Bookmark your favorite scenes from the movie then share with your BDLiveTM buddies!